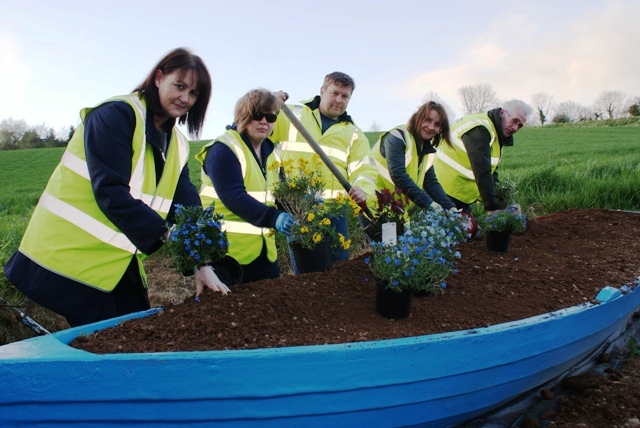 Tidy Towns members, Karolyne Dineen, Mairead O Buachalla, Henry Delaney, Martha and John McCaffery busily replanting the boat in preparation of the upcoming Coachford Angling Festival which begins this weekend. The May Bank Holiday sees the beginning of a month long major Angling competition for the river Lee in Coachford. The one day event on Friday May 3rd will see anglers from England, Wales and all over Ireland descend on the area for the first of this month long Coarse and feeder fishing events. Saturday May 4th to Monday May 6th will see the competition for the O’Callaghan’s Bar Cup takes place in and around Coachford. As part of the Coachford Open another three day event begins on May 7th and ends on May 9th. The festival of fishing continues from May 12th to 18th when the Dutch fishermen will join the home nations to compete in the May Open and the Village Inn Cup. Local business man, John Hogan said “ May is a great month on the river for angling. A huge number of anglers who have been coming here to enjoy the excellent fishing on the river return year after year. It’s a great boost for the shops, B&Bs, Hotels and pubs in the area. In the last couple of years we have seen more people providing other services for the fishermen such as live bait and boats. The superb Lee Valley Harbour in Carrigadrohid is a wonderful addition to the area and shows how development along the river can provide jobs and growth for Coachford and Mid Cork”. Canovee Gaa is holding a Fundraising Auction on Bank Holiday Monday in Canovee National School. Viewing takes place from 3pm on the Bank Holiday and the auction begins at 5pm. If you have any items suitable for auction, such as furniture, bikes, baby equipment and other good quality items please contact Mary on 087 6422527. The transition year students at Coachford College took part in the Less Is More Challenge for Earth Day recently. The students planted an Amalanchier tree which was kindly donated by Griffins Garden Centre. Students have also been taking part in a Numeracy Challenge at lunchtime, a fundraising raffle for the new school pitch and a cake sale in aid of the Hope Foundation. Meanwhile exam students are busy revising and preparing for the national exams commencing in next month. Music is the order of the day this holiday weekend in Coachford. On this Friday night Aghinagh Comhaltas will provide the entertainment in Breathnachs Bar as they hold their monthly traditional session. On Sunday night both O Riordan’s Bar and The Village Inn will provide music and entertainment for their customers. Gala Supermarket will be drawing the winning ticket of the April shopping promotion for the fabulous Chopper bicycle. This weekend also marks the beginning of summer and Cooney’s Quik Pick are extending their weekday opening hours to 10pm from this Thursday. The very best of luck to the Aghabullogue Intermediate footballers who play city side Mayfield in the first round of the championship this Sunday at 2.30pm in Blarney. The boys have suffered league defeats to Canovee and Fermoy recently and as a result go into this decider as underdogs. They need and deserve everyone’s support. Congratulations to the Breathnach’s Bar Darts team who captured the Lee Valley Championship cup last weekend for the first time. The team of Paddy, Adrian and Nicky Martin, Ger Carey, James O’Connell, Nick Moore and Dean Knight conducted a tremendous campaign to reach the final. Their opposition in that final played in the Abbey Hotel Ballyvourney was the Wallis Arms, Millstreet. The Coachford side suffered defeat in their early games on the night but won the third singles game. The lads from Breathnach’s then lost the fourth and fifth singles and were down 3-2 at the break. However at the restart Nick Martin and Nick Moore won to bring the match to a tie and the excellent pairing of Paddy and Adrian Martin won the decider to spark tremendous excitement and celebrations. Team manager Mary Cronin of Breathnach’s Bar said,” This was a great victory and great credit is due to the lads. They trained hard all year and they really dug out their best games when they had to. Our B team also had a great campaign and it’s great that this championship is coming to Coachford for the first time in it’s history”. The Dew Drop Inn Bar in Peake, Coachford were also victorious at the finals beating An Crois Bar from Cill Na Martra in the Shield Final. There was no winner of the €6,400 jackpot. The numbers drawn were 7, 17 and 18. Lucky dip winners were Michael 7 Claire Cronin (€40), Tim Griffin, Marie Hayes, Isabelle Leahy and Mossie Keane (€20 each). Next week’s jackpot is €6,600 and the draw takes place in O’ Callaghan’s Bar next Tuesday.